Prepare to meet a young woman who thinks she knows everything. Fresh from university, Emma Woodhouse triumphantly arrives home in Norfolk ready to embark on adult life with a splash. Not only has her sister, Isabella, been whisked away on a motorcycle up to London, but her astute governess, Miss Taylor is at a loose end, abandoned in the giant family pile, Hartfield, alongside Emma's anxiety-ridden father. Someone is needed to rule the roost and young Emma is more than happy to oblige. As she gets her fledging design business off the ground, there is plenty to delight her in the buzzing little village of Highbury. At the helm of her own dinner parties and instructing her new little protégée, Harriet Smith, Emma reigns forth. But there is only one person who can play with Emma's indestructible confidence, her old friend and inscrutable neighbour George Knightley - this time has Emma finally met her match? You don't have to be in London to go to parties, find amusement or make trouble. Not if you're Emma, the very big fish in the rather small pond. But for a young woman who knows everything, Emma has a lot to learn about herself. 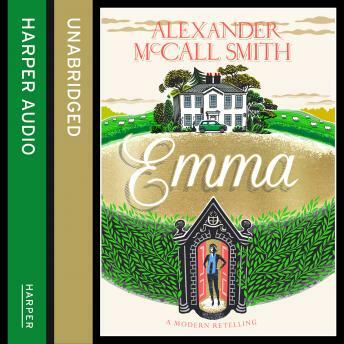 Ever alive to the uproarious nuances of human behaviour, and both the pleasures and pitfalls of village life, beloved author Alexander McCall Smith's Emma is the busybody we all know and love, and a true modern delight.